I don’t know if I would go as far as suggesting that the tagline is anywhere close to correct. Yes, the film was terrifying at times. I found myself leaning backwards into the couch, trying to keep my eyes off the screen as sharp objects kept finding their way towards people’s fragile frames. 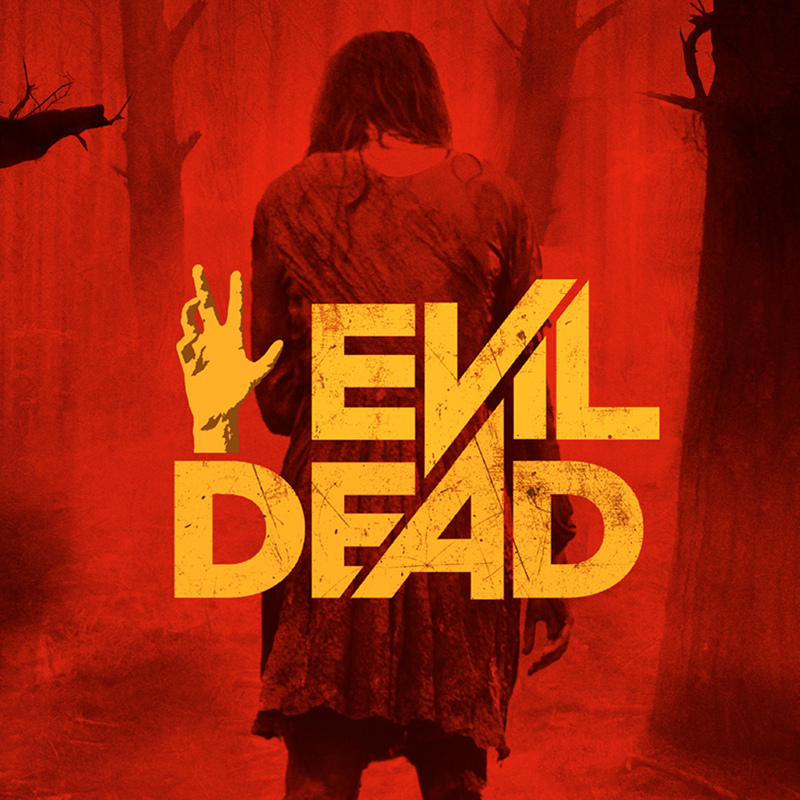 But Evil Dead was so much fun and so in-your-face with its seemingly limitless gore that you just can’t look away. It’s not over the top, funny gore like in the original (and definitely not the latter two films with their purposefully comedic tone). Evil Dead really ramps up the fear factor with buckets of blood. It slaps its viewers in the face with severed limbs and demands that you watch the entire hour and a half run time that’s pretty much non-stop craziness – and yes, there’s a few of those in there. Severed limbs, I mean. It starts off as your typical horror film: five friends head out to a remote cabin, one of them unwittingly unleashes demons, who begin to possess and pick off said friends. We’ve seen it all before, and it draws directly from its predecessor. But what separates Evil Dead from the rest of the horror pack, especially reboots and remakes, is its love of the source material. With Raimi and Campbell on board as producers, it gave fans of the originals and the genre in general reason to hope, and I think that this one delivered pretty well. The nods to 1981 version and its follow-ups abounded: the awesome, stalking-inspired tracking shots, locking the possessed girl in the cellar, the shotg- excuse me, boomsticks, the severed hand, the chainsaw, the hand rising through the ground grabbing the girl’s throat… I could go on. There’s just references enough for fans of the original to draw the parallels and go “yes! I remember that,” without relying on them as a crutch. Supplanting Ash with Mia was a brilliant move, and the parallels are just enough to have her sort of take over as the hero – and its something Jane Levy does with a sure hand and great acting, even if she is in zombie mode half of the time. Alvarez makes Evil Dead his own, and instead of focusing on the macabre humor and sexual undertones that existed in the original, he chooses instead to key in on the horror and gore to really gross out the audiences (hint: it worked). It didn’t escape some of the predictable horror tropes and jump scares, but I didn’t mind – and keep in mind, this is coming from The Gent, who typically has trouble digesting freaky flicks. Stupid decision making such as reading the Necronomicon (Really? You’re going to read the book scrawled in devilish obscenities that’s bound in human skin?) and the disbelief that something is going wrong were just two immediate flaws in these characters that stood out. There were more, and it took away from what could have been a completely frightening and memorable experience. Evil Dead stands apart from The Evil Dead to be sure, but it does so with just enough allure and staying power to warrant addition to your yearly Halloween cannon – I know its in consideration for mine, and Evil Dead will be scaring viewers at drive in theaters and basement sleepovers for years to come. Shane Carruth has made it much harder to exclude him from the company of modern auteurs. I didn’t expect much when I gave Primer, Carruth’s 2004 independent sci-fi debut, a try a few years ago. Not only am I still struggling to wrap my head around it to this day, but it has definitely opened me up to giving low budget science fiction a chance (Moon & Timecrimes are just two of the many that come to mind). But time has proven wise, and instead of being a one-off director whose vision has been obscured by other shortcomings, Carruth has proven he’s more capable than many in the field today; like Primer, Carruth wrote, directed, produced, starred in, and scored his follow up feature Upstream Color. It’s been hailed as breathtakingly beautiful. It’s been scorned as not having much direction and being to hard to handle because of its abstract nature. Whatever your take on it, I can assure you you’ve never seen a movie quite like it. Upstream Color reflects on pretty basic human experiences: how we relate to other people through love and deceit, about forging one’s own identity, and about dealing with tragedy and life-altering experiences. It’s not easy to wrap your head around, and after two viewings there’s clearly a lot I still have to sort out. Color is eventful but placid through its first 30 minutes. Kris (Amy Seimetz) is abducted by a man listed in the credits as “The Thief” (Thiago Martins), who induces a trance-like state through the use of a parasite and instructs her to empty out all of her accounts while keeping her distracted by making her transcribe Henry David Thoreau’s “Walden.” We see later that “The Thief” comprises one-third of a cycle that includes “The Sampler” (Andrew Sensenig), who removes the parasites from their human host and transplants them to pigs on his farm, and the “Orchid Mother” and “Orchid Daughter” (Kathy Curruth and Meredith Burke, respectively). Without giving too much away about how they all connect, they form a triangle that traps Kris and Jeff (Shane Carruth) in a nightmarish reality, having been robbed of their former lives and all of their assets. Jeff meets Kris on the train and they share an unspoken connection, one that becomes more apparent and frightening as the film slowly angles up and takes aim at its climax. As Kris and Jeff grow closer and begin to lose a grip on their individual identities, I was left to ponder how I would respond if I were the one in this situation. How would I respond to the loss of my children, or the inability to have them? Would I get up and take charge if my life as I knew it was suddenly ripped out from under me like a warm, familiar rug, and I was left standing on cold tile? And the final scene – has Kris reached some kind of inner peace? The sun is shining consistently for the first time all movie, but has she really found conciliation in the face of so much confusion, despair, and torment? I’m glad that Carruth doesn’t take the easy way out and give us the answers. He forces the viewer to make up their own mind, even if they aren’t entirely sure what they believe. What really sealed the deal and helped to entrance me, like one under the influence of those little white worms, was the soundtrack. It is elegant in its simplicity, but fiercely complex when accompanied by the stark colors and engaging visuals, and often manifests itself throughout the narrative as diagetic sound. Again, much of it was taken from nature and used by “The Sampler,” adding to its mysterious and ambient qualities, and adding to the theme I previously mentioned. Upstream Color is worth submitting to. Its ambiguity is where it derives its strength, in asking us to face questions we don’t know the answer to. There’s no explicit solace to be found in the ending, but it’s strangely comforting knowing these characters for the hour and thirty-nine minute run time and following them to the end of this twisted tale of morality, identity, and loss. The film’s tagline seemed hopelessly veiled at first, but it’s starting to make more sense. You can’t help what happens to you, and you can try to change it but those experiences will always be there to affect you, for better or for worse. The best part, though? I could be completely wrong, and that won’t do a thing to lessen the impact that Shane Carruth’s sophomore effort has made on me, and will continue to make, for quite some time. As a child, I remember looking up and being fascinated by space. Its size, possibilities, and emptiness were magical, and there is still something about the final frontier that captures that sense of childlike wonder, even as I grow older. Gravity plays on just that and much, much more. You see, in addition to being space’s awe-inspiring properties, it also has the ability to produce a primal fear in us. One of Gravity’s opening title cards reminds us that nothing can survive in space, a phrase that immediately intimidates that aforementioned child who looked up at the stars. There aren’t many things more terrifying than dying of oxygen deprivation in that cold emptiness. Floating into blackness, alone, as your O2 supplies dwindle is pure nightmare fuel to me, precisely because it’s possible, and that’s the source of Alfonso Cuarón’s project’s strength – all of the scenarios he hurls at the viewer are scientifically possible (with one or two exceptions), and absolutely plausible. None of the suspense in Gravity would be possible if director/writer Cuarón (Harry Potter and the Prizoner of Azkaban, Children of Men) didn’t force the viewer to invest in George Clooney and Sandra Bullock from the get-go. 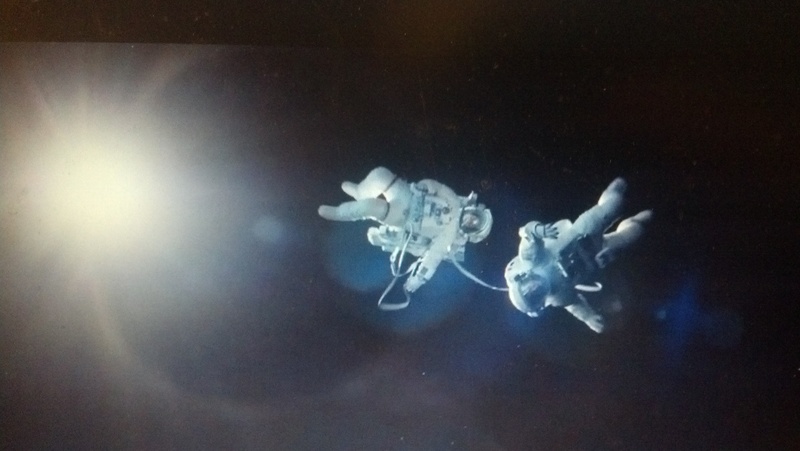 Long takes have been used throughout cinema history to create dramatic effect and showcase characters (think Citizen Kane’s childhood scene or the opening shot in Cuarón’s Children of Men), and Gravity’s 17-minute opening shot scene out as one of the most breathtaking in film history. That view of Earth mimiced documentary footage with a flair for the fantastic. Cuarón told the New York Times that “the ultimate goal of this whole experiment was for the audiences to feel as if they are a third character who is floating with our other two characters in space.” He and five-time Oscar nominated cinematographer Emmanuel Lubezki (The New World, Children of Men) use experimental shots and play with sound to engage the viewer through several senses at once, often switching between first and third person several times within a single take. It’s a bit disorienting but it’s wildly effective, and you feel as isolated and helpless as Bullock’s Dr. Ryan Stone. And Clonney put in a great turn as veteran astronaut Matt Kowalski, the cocky but lovable guy on his last mission miles above the earth. If I have to be honest with you, though, it was space that really stole the show. The viewer is constantly reminded of its all-emcompassing darkness and sheer immensity at just about every turn, and its incredible beauty was constantantly juxtaposed with the danger that it also holds. Clooney’s tear-enducing sunset call and Bullock’s conversation with Aningaaq as she loses hope in a suicidal spiral are some of the most awe inspiring yet chilling scenes I’ve ever seen (fun fact: there’s a seven-minute campanion short to Gravity called Aningaaq, directed by Cuarón’s 34-year old son about the latter scene). Space constantly threatens, but it constantly reminds Stone and Kowalski of life’s brilliance. Unlike 2001: A Space Oddessy, Gravity opts not to ponder philisophical themes and warp perception, though it does explore the psychology of its characters. It also plays on motifs of life and death, beauty and emptiness, and survival at all costs. The cinematography is sure to get a nod at this year’s Academy Awards, and right now this has to be the best movie I’ve seen all year. Steven Price’s fantastic score sealed the deal with its multiple tones ranging from ambient to full on blarring desperation to elevate this work from great to unbelievable. Shell out the $15 to see this one in Imax, as Gravity is one of the few films that is enhanced by 3D. Cuarón’s modern masterpiece will inspire for years to come.